In baking, leavening is the process that creates air bubbles enabling breads, cakes, and other baked goodies to rise when they go in the oven. This trapped air is what gives baked goods their light and fluffy texture. In our dough, we use fresh yeast to create these air pockets that produce our light and crispy, yet soft and chewy crust. As you are probably aware, most gluten-free crusts have zero leavening when they bake. It’s part of what makes most gluten-free crusts cracker-like and crumbly or dense and gummy and unable to withstand the weight of toppings. That’s a no-no in our book. 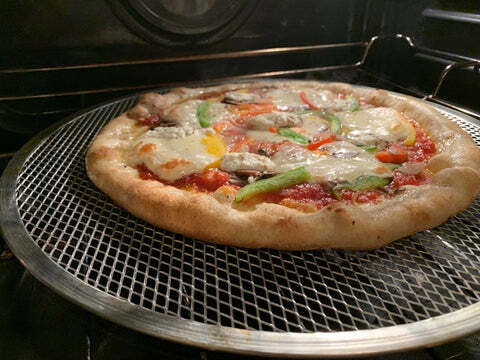 Many gluten-free brands pre-bake their pizza crusts before they freeze them in order to produce a crust-like semblance. Our pizzas come completely unbaked. So you might be asking, does yeast have gluten? Nope! With fresh yeast in our dough, it is ready and waiting for you to put it in your oven to create a beautiful and bubbly crust that’s light and crisp, yet soft and chewy. Yum! In the gluten-free realm, this type of natural rise in a pizza crust is unheard of. Thank you fresh yeast! Cheers to glorious fluffy, air-filled pockets of doughliciousness! There are some pizzas out there with self-rising crusts, but they are not gluten-free. And they typically use chemical leavening, producing a less flavorful and lower-rise crust. Chemical leavening uses baking soda or baking powder combined with an acidic ingredient to cause air bubbles to form. From our perspective, yeast is the only way to go when you’re looking to get the best rise and flavor in a pizza crust. Is it harder to make? You bet! But, does it taste great? Absolutely! Unlike chemical leaveners, yeast contributes to the flavor of the dough and the height of the air pockets created in the crust. There is some debate as to whether fresh yeast or dry yeast is better. We believe that fresh yeast provides a deeper depth of flavor to dough than dry yeast. That’s why we always use fresh yeast!